^ 3.0 3.1 3.2 Contracts for Friday December 19th 2008. 2008-12-19 [2010-06-25]. ^ Take a Close Look at the Marines Infantry Automatic Rifle [IAR]. Soldier of Fortune. Soldier of Fortune Magazine. [3 September 2017]. ^ 7.0 7.1 7.2 Cox, Matthew. So long, SAW?. Marine Corps Times. September 15, 2008 [2 July 2010]. （原始内容存档于2010年7月6日）. ^ Lamothe, Dan. Marines to test, evaluate 4 auto-rifle models. Marine Corps Times. February 4, 2009 [2 July 2010]. （原始内容存档于2010年5月15日）. ^ 9.0 9.1 Corps to Replace SAW With Automatic Rifle. Military.com. 2011 [20 July 2011]. ^ 11.0 11.1 10—Non-developmental, 5.56mm, Infantry Automatic Rifle (IAR). FedBizOpp. July 14, 2005 [20 August 2010]. ^ M6A4. LWRC. 2009 [2 July 2010]. ^ Richard Machowicz. Opening Round. Future Weapons. 第3季. 15 November 2007 [3 February 2011]. Discovery Channel. ^ 15.0 15.1 15.2 Lamothe, Dan. Conway eyes additional testing for auto-rifle. Marine Corps Times. July 2, 2010 [2 July 2010]. （原始内容存档于2011年7月14日）. ^ 10--Non-developmental, 5.56mm, Infantry Automatic Rifle (IAR). FedBizOpp. July 14, 2005 [20 August 2010]. ^ Lamothe, Dan. Corps may field infantry auto-rifle this fall. Marine Corps Times. April 19, 2010 [19 April 2010]. （原始内容存档于2012年3月8日）. ^ 20.0 20.1 Lamothe, Dan. SAW replacement set for real world testing. Marine Corps Times. August 9, 2010 [10 August 2010]. （原始内容存档于2012年3月8日）. ^ Corps to Replace SAW With Automatic Rifle. Military.com. 2011 [16 July 2011]. ^ Sanborn, James K. Deadlier rifles and ammo may be on the way. Marine Corps Times. Gannett Company. February 16, 2015 [21 February 2015]. A free floating barrel could improve the M16A4 from a 4.5 minute-of-impact rifle to a 2 MOI rifle, putting it on par with the M27 Infantry Automatic Rifle, which uses a free floating barrel, said Chief Warrant Officer 5 Vince Pope, the Marine gunner who directs the Marksmanship Doctrine and Programs Management Section at Quantico. ^ Crane, David. U.S. Marine Corps Selects Heckler & Koch Infantry Automatic Rifle (HK IAR) Candidate as Replacement for FN M249 SAW/LMG. defensereview.com. December 4, 2009 [20 August 2010]. ^ M27 Infanty Aotomatic Rifle. 2010-06-07 [2010-06-25]. 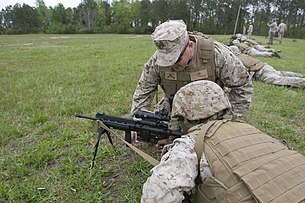 ^ The Corps is on track to fully field the M38 marksman rifle, despite setbacks for the M27 IAR. Marine Corps Times. 27 April 2018. （英文）— Curtis, Rob. H&K wins Marine Corps IAR contract with HK416 variant. 軍隊時報. December 2, 2009 [2010年7月2日]. （英文）— Popenker, Maxim. Heckler-Koch HK M27 IAR Infantry Automatic Rifle (USA / Germany). World Guns. 2010 [3 February 2011]. （英文）— Custis, Jon, Major USMC. The Infantry Automatic Rifle: Closing the last 5 yards. Marine Corps Gazette Volume 95 Number 6. 2011 [18 June 2011]. Are The Marines Done with Suppressing Fire? IAR M27 (infantry automatic rifle) is Afghan-bound with five battalions. Infantry Automatic Rifle ‘could’ Replace all SAWs. USMC exercises Infantry Automatic Rifle full-rate production delivery order to HK (video).